Okay. We should clear the air from the beginning here: rice pudding IS. MY. LIFE. I'm talking about your super traditional, heavy-on-the-cream, sugar-cinnamon-sprinkled, ate-it-for-three-straight-weeks-in-Athens type. There is nothing better. Hopefully my very Greek aunt (and dad, for that matter) don't take this to be total blasphemy, but: the British are coming. In the form of Jamie Oliver's Jamie At Home cookbook, a follow-up to one of my favorite cooking shows ever casted and one that every proper cook should own, meat-eating or otherwise. It's got something for everyone. 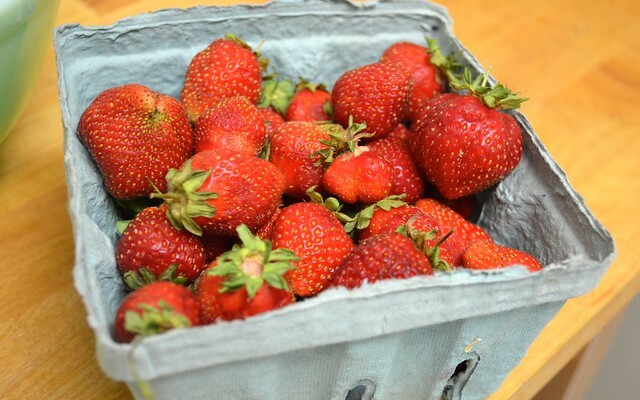 The whole point of this recipe is to highlight the star of the show: fresh summer strawberries. Oh my heavens, there's nothing like them. And believe it or not, I think our season for this year is already coming to a rapid close. Which is a huge bummer, but all the more reason to preserve what's left of these ruby-hued beauties into sweet, beautiful jam. Jamie knows what's the what. 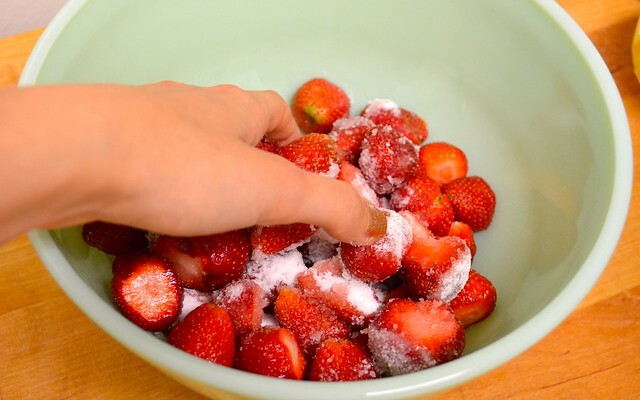 To get started, add your hulled strawberries to a large bowl. 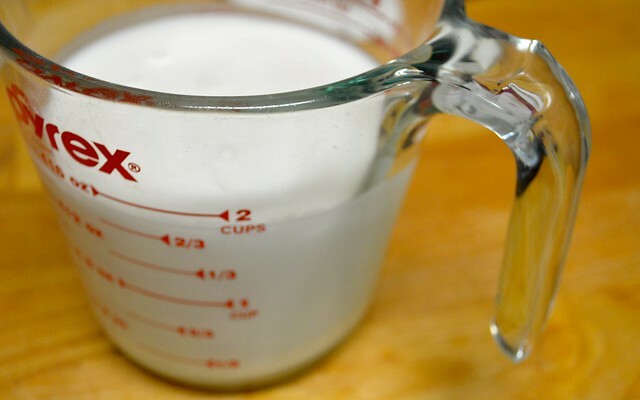 Sprinkle your 1/4 cup of sugar on top and squish together with your hands. That's right: squish together. With YOUR HANDS! Watching Jamie do this in the strawberry episode of Jamie At Home is amazing, such a crucial element to his hands-on (GET IT?!) cooking style. Love it. Of course, if you're a little daintier than Jamie or I, you can always give them a good smash with a fork or a potato masher. The point here is to get the sugar as dissolved as possible before adding your fruit to the heat. 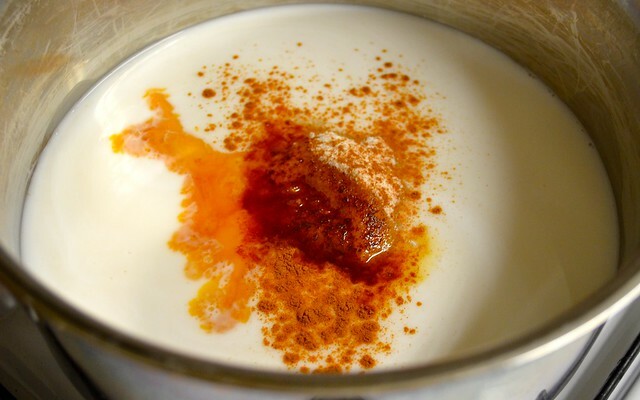 Meanwhile, add your coconut milk, rice, sugar, vanilla and cinnamon to a second medium saucepan. Bring to a quick simmer, lower the heat and attach your lid, allowing to cook for about 30 minutes. 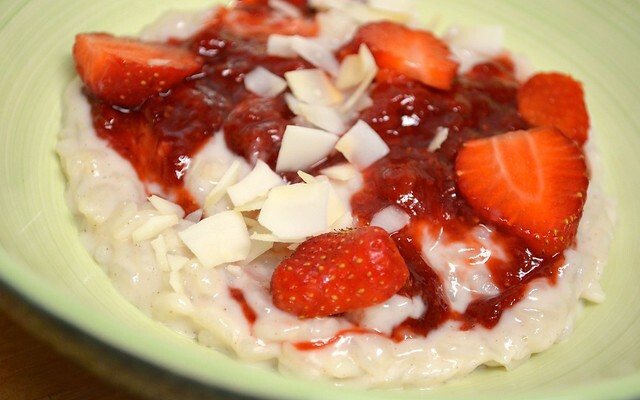 Give it a stir every now and then to check the consistency, but if you've had rice pudding before, you know what to watch for: or, as Jamie aptly describes it, "creamy and oozy." Perfect. If you can time it right, both of your amazing mixtures should be ready around the same time. 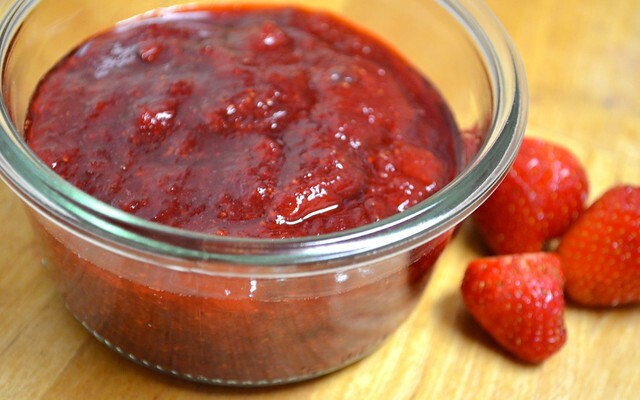 If your jam reaches its perfect jammi-ness before your pudding is ready, remove from the heat and set aside. You don't want to eat boiling hot jam, anyway. 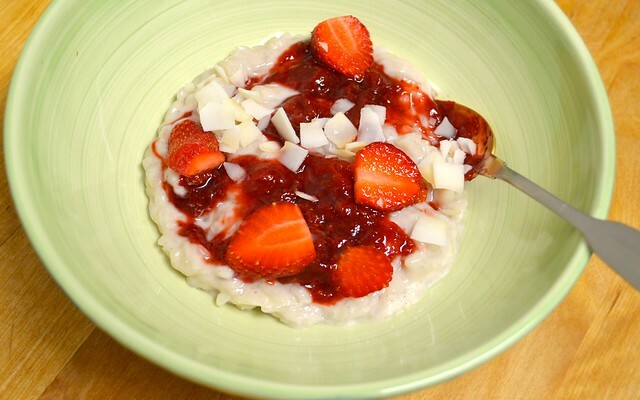 When the rice is done and your kitchen and entire home are smelling like a masterpiece of dessert heaven, scoop your warm pudding into wide bowls and top with the strawberry jam. You could stop there, but I wouldn't recommend it: adding a few coconut chips to your dish for crunch (or if you aren't worried about the vegan factor, as per Jamie's suggestion, crushed meringue cookies) will take it from so good to I've-lost-the-ability-to-speak amazing. What I love about this is the very mild sweetness of the rice itself. 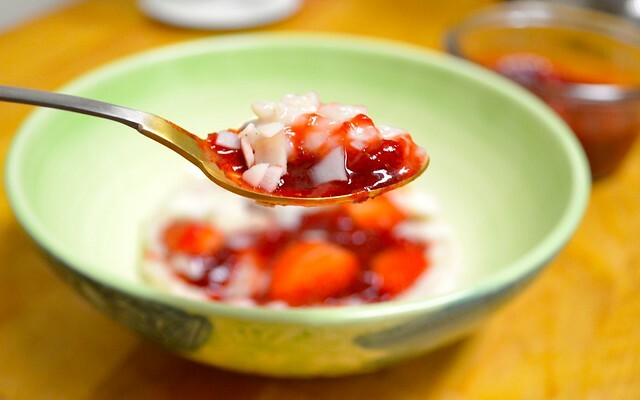 All that beautiful, summery flavor comes from the jammy fruit, which is so good for other uses (if it makes it there, that is) like morning toast and over yogurt. I'm totally making this again. Peach jam? Fig jam? I'm going to go jam-pudding crazy.